The Floret Forest hair clips have organic shapes with perfect crystal details...Wear them as a set or separably for a more subtle look. The Floret Forest looks beautiful on everyone and they hold onto the hair perfectly. Made with love in USA of Austrian Crystals, Austrian Pearls, Quartz, Czech Glass, Oxidized metal. Sold in set of 4. Arrives on beautiful card. Hand designed by Tammy. The Lulu Forest hair clips have organic shapes with perfect crystal details...Wear them as a set or separably for a more subtle look. The Lulu Forest looks beautiful on everyone and they hold onto the hair perfectly. Made with love in USA of Austrian Crystals, Austrian Pearls, Quartz, Czech Glass, Oxidized metal. Sold in set of 4. Arrives on beautiful card. Hand designed by Tammy. The Sparkling Forest hair clips have organic shapes with perfect crystal details...Wear them as a set or separably for a more subtle look. The Sparkling Forest looks beautiful on everyone and they hold onto the hair perfectly. Made with love in USA of Austrian Crystals, Austrian Pearls, Quartz, Czech Glass, Oxidized metal. Sold in set of 4. Arrives on beautiful card. Hand designed by Tammy. The Golden Forest hair clips have organic shapes with perfect crystal details...Wear them as a set or separably for a more subtle look. The Golden Forest looks beautiful on everyone and they hold onto the hair perfectly. Made with love in USA of Austrian Crystals, Austrian Pearls, Quartz, Czech Glass, Oxidized metal. Sold in set of 4. Arrives on beautiful card. Hand designed by Tammy. The Ocean Forest hair clips have organic shapes with perfect crystal details...Wear them as a set or separably for a more subtle look. The Ocean Forest looks beautiful on everyone and they hold onto the hair perfectly. Made with love in USA of Austrian Crystals, Austrian Pearls, Quartz, Czech Glass, Oxidized metal. Sold in set of 4. Arrives on beautiful card. Hand designed by Tammy. The Blossom Forest hair clips have organic shapes with perfect crystal details...Wear them as a set or separably for a more subtle look. The Blossom Forest looks beautiful on everyone and they hold onto the hair perfectly. Made with love in USA of Austrian Crystals, Austrian Pearls, Quartz, Czech Glass, Oxidized metal. Sold in set of 4. Arrives on beautiful card. Hand designed by Tammy. The Havana Forest hair clips have organic shapes with perfect crystal details...Wear them as a set or separably for a more subtle look. The Havana Forest looks beautiful on everyone and they hold onto the hair perfectly. Made with love in USA of Austrian Crystals, Austrian Pearls, Quartz, Czech Glass, Oxidized metal. Sold in set of 4. Arrives on beautiful card. Hand designed by Tammy. 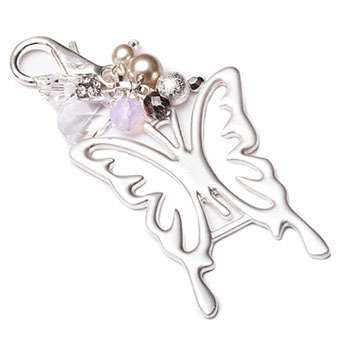 The Butterfly Charm keychain can also be used as a purse charm, luggage charm, and necklace charm. Made with love in the USA of Austrian Crystal and antiqued metal. Hand designed by Tammy. Every IT girl imaginable has been rocking the ’90s-inspired choker look in heavy rotation with both day and night ensembles. Wear this necklace alone for a Sweet Girly look or Sassy it up by layering it with a lariat or other choker style necklaces...Made with love of Austrian Crystals, Sterling Silver, and leather. 12'' in length with a 3'' extender. Hand designed by Tammy. Made with love in the USA of Swarovski Crystals, Sterling Silver or 14-K Gold Filled. Standard size 7 fits most. Made with love in the USA of Swarovski Crystals, Sterling Silver, Rose Gold and 14-K Gold Filled. Tammy Spice is known for her stylish bracelets...With unique color stories and materials wear alone or layer them all for a gorgeous arm party...YOU will LOVE them ALL... Made with love in the USA of Agate, Jasper, Sky Quartz, Crystal Quartz, Turquoise, Jade, Mother of Pearl, Austrian Crystals, Austrian Pearls, Czech Glass, Sterling Silver or 14K filled gold. They are 7'' expandable. Hand designed by Tammy. **Skulls symbolize protection, strength, power, fearlessness, wisdom and guidance, overcoming death, surviving through a difficult time, or even immortality. Tammy Spice is known for her stylish bracelets...With unique color stories and materials wear alone or layer them all for a gorgeous arm party...YOU will LOVE them ALL... Made with love in the USA of Agate, Jasper, Sky Quartz, Crystal Quartz, Turquoise, Jade, Mother of Pearl, Austrian Crystals, Austrian Pearls, Czech Glass, Sterling Silver or 14K filled gold. They are 7'' expandable. Hand designed by Tammy. **Fleur-de-lis (flower of the Lily) represents French royalty, and in that sense it is said to signify perfection, light, and life. Tammy Spice is known for her stylish bracelets...With unique color stories and materials wear alone or layer them all for a gorgeous arm party...YOU will LOVE them ALL... Made with love in the USA of Agate, Jasper, Sky Quartz, Crystal Quartz, Turquoise, Jade, Mother of Pearl, Austrian Crystals, Austrian Pearls, Czech Glass, Sterling Silver or 14K filled gold. They are 7'' expandable. Hand designed by Tammy. **The key is an object symbolic of opening and closing powers. It represents knowledge, mystery, initiation, and curiosity. Tammy Spice is known for her stylish bracelets...With unique color stories and materials wear alone or layer them all for a gorgeous arm party...YOU will LOVE them ALL... Made with love in the USA of Agate, Jasper, Sky Quartz, Crystal Quartz, Turquoise, Jade, Mother of Pearl, Austrian Crystals, Austrian Pearls, Czech Glass, Sterling Silver or 14K filled gold. They are 7'' expandable. Hand designed by Tammy. ** The Owl is symbolic for: Wisdom, Mystery, Transition, Messages, Intelligence, Mysticism, Protection, Secrets. Tammy Spice is known for her stylish bracelets...With unique color stories and materials wear alone or layer them all for a gorgeous arm party...YOU will LOVE them ALL... Made with love in the USA of Agate, Jasper, Sky Quartz, Crystal Quartz, Turquoise, Jade, Mother of Pearl, Austrian Crystals, Austrian Pearls, Czech Glass, Sterling Silver or 14K filled gold. They are 7'' expandable. Hand designed by Tammy. **A fully blooming Lotus flower signifies enlightenment, while a closed bud represents a time before enlightenment. Tammy Spice is known for her stylish bracelets...With unique color stories and materials wear alone or layer them all for a gorgeous arm party...YOU will LOVE them ALL... Made with love in the USA of Agate, Jasper, Sky Quartz, Crystal Quartz, Turquoise, Jade, Mother of Pearl, Austrian Crystals, Austrian Pearls, Czech Glass, Sterling Silver or 14K filled gold. They are 7'' expandable. Hand designed by Tammy. **Each leaf of a four-leaf clover has a specific meaning; faith, hope, love and luck. A person who finds one will meet a future lover on the same day. The clover brings good luck and protects against evil. Tammy Spice is known for her stylish bracelets...With unique color stories and materials wear alone or layer them all for a gorgeous arm party...YOU will LOVE them ALL... Made with love in the USA of Agate, Jasper, Sky Quartz, Crystal Quartz, Turquoise, Jade, Mother of Pearl, Austrian Crystals, Austrian Pearls, Czech Glass, Sterling Silver or 14K filled gold. They are 7'' expandable. Hand designed by Tammy. **A Leaf signifies truth, happiness, healing and perseverance. Tammy Spice is known for her stylish bracelets...With unique color stories and materials wear alone or layer them all for a gorgeous arm party...YOU will LOVE them ALL... Made with love in the USA of Agate, Jasper, Sky Quartz, Crystal Quartz, Turquoise, Jade, Mother of Pearl, Austrian Crystals, Austrian Pearls, Czech Glass, Sterling Silver or 14K filled gold. They are 7'' expandable. Hand designed by Tammy. **It is believed that the arrowhead protected from illness and acted as a guard against the Evil Eye. It will deflect negative energy, protect you from your enemies and absorb their power. Tammy Spice is known for her stylish bracelets...With unique color stories and materials wear alone or layer them all for a gorgeous arm party...YOU will LOVE them ALL... Made with love in the USA of Agate, Jasper, Sky Quartz, Crystal Quartz, Turquoise, Jade, Mother of Pearl, Austrian Crystals, Austrian Pearls, Czech Glass, Sterling Silver or 14K filled gold. They are 7'' expandable. Hand designed by Tammy. **The Horn is an amulet of good luck used for protection against the evil eye curse. Tammy Spice is known for her stylish bracelets...With unique color stories and materials wear alone or layer them all for a gorgeous arm party...YOU will LOVE them ALL... Made with love in the USA of Agate, Jasper, Sky Quartz, Crystal Quartz, Turquoise, Jade, Mother of Pearl, Austrian Crystals, Austrian Pearls, Czech Glass, Sterling Silver or 14K filled gold. They are 7'' expandable. Hand designed by Tammy. 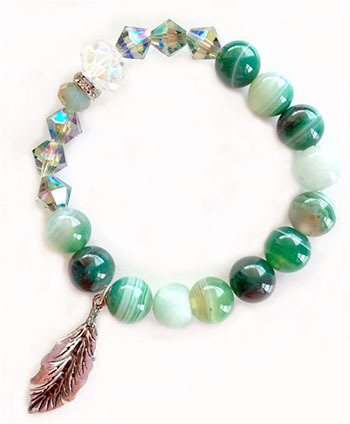 YOU will LOVE them ALL... Made with love in the USA of Agate, Jasper, Sky Quartz, Crystal Quartz, Turquoise, Jade, Mother of Pearl, Austrian Crystals, Austrian Pearls, Czech Glass, Sterling Silver or 14K filled gold. They are 7'' expandable. Hand designed by Tammy.